Despite being a non-Muslim, Hong-Wu ordered the construction of several mosques in Nanjing, Yunnan, Guangdong and Fujian as well as adorning the mosques with the inscriptions of the name of the Prophet Muhammad. He was also responsible for the rebuilding of the Jinjue Mosque in Nanjing and large numbers of Hui (Muslim Chinese) people moved to the city during his rule. Hong-Wu also included 10 Muslim generals in his army, including Chang Yuchun, Lan Yu, Ding Dexing, Mu Ying, Feng Sheng and Hu Dahai. 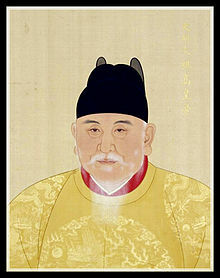 In addition, Hong-Wu’s spouse, Empress Ma, was also a descendant from a Muslim family while he was originally a member of a Muslim rebel group led by Guo Zhixin. Translated by Musa Cerantanio, a Melbourne based scholar, the eulogy is in the form of a poem, each verse containing 4 words (characters) and 4 syllables. He says, “In the translation below I have strayed away from trying to keep the 4 word per verse translation in favour of a more literal translation which conveys the full meaning in flowing English”.